Lisbon Summit will be surely remembered as one of the lost opportunity of the North Atlantic Treaty to reform and to obtain a new significance in the XXI century. Instead of this, the Summit concentrated on an unwinnable war in Afghanistan and lost the sight of the fact that already Taliban’s are a force that can’t be uprooted from the country. No mention of the corruption and inefficiency that is crippling afghan army and administration and is making unthinkable the time line of 2014 for redraw from Afghanistan. After days of planning to win a war that is already lost on the ground the Summit turn his attention on the much anticipated European defense shield construction. Here also the summit did not produced any new information, still the same countries Romania and Bulgaria are accepting the defense shield while there are all the indication that Turkey will refuse the military installation on here soil. The Russia – NATO discussion was a new failure of this summit: Russia wanted security concern alleviated and a meaningful discussion on defense shield. Instead of this Russia was proposed an anti-Iran and anti-China partnership and support for President Dimitry Medvedev reform plans against Prime Minister Vladimir Putin conservative agenda. The new security concept of NATO that should have prepared the alliance for the new century is still the old one discussed in Bucharest in 2008 plus for convenience two lines on global warming and on cyber terrorism. For Romania this a specially unfruitful summit as Romanian delegation goes unprepared to the summit and suffered serious humiliation from the part of French and Italian delegation that refused even the protocol necessary contact. Supplementary Romania accepted the plan of missile defense shield without any security guarantee or material compensation (for comparison Turkey was offered a financial package of 40 billion euro for the same deal that Romania got nothing). Romanian national interests in Black Sea region where ignored but we received the honor of being the country that will head the next wave of antiterrorist war, a word that is hiding the attack on Iran nuclear facilities. 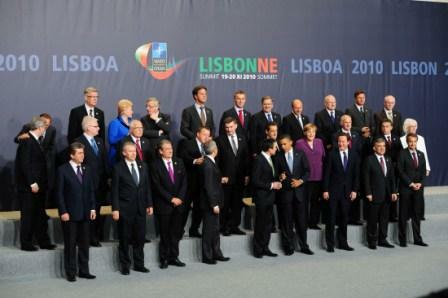 In conclusion if for Romania the Lisbon summit was an unprecedented humiliation for NATO it was a missed opportunity. NATO’s fundamental and enduring purpose is to safeguard the freedom and security of all its members by political and military means. Today, the Alliance remains an essential source of stability in an unpredictable world. NATO member states form a unique community of values, committed to the principles of individual liberty, democracy, human rights and the rule of law. The Alliance is firmly committed to the purposes and principles of the Charter of the United Nations, and to the Washington Treaty, which affirms the primary responsibility of the Security Council for the maintenance of international peace and security. The political and military bonds between Europe and North America have been forged in NATO since the Alliance was founded in 1949; the transatlantic link remains as strong, and as important to the preservation of Euro-Atlantic peace and security, as ever. The security of NATO members on both sides of the Atlantic is indivisible. We will continue to defend it together, on the basis of solidarity, shared purpose and fair burden-sharing. Collective defence. NATO members will always assist each other against attack, in accordance with Article 5 of the Washington Treaty. That commitment remains firm and binding. NATO will deter and defend against any threat of aggression, and against emerging security challenges where they threaten the fundamental security of individual Allies or the Alliance as a whole. Crisis management. NATO has a unique and robust set of political and military capabilities to address the full spectrum of crises – before, during and after conflicts. NATO will actively employ an appropriate mix of those political and military tools to help manage developing crises that have the potential to affect Alliance security, before they escalate into conflicts; to stop ongoing conflicts where they affect Alliance security; and to help consolidate stability in post-conflict situations where that contributes to Euro-Atlantic security. Cooperative security. The Alliance is affected by, and can affect, political and security developments beyond its borders. The Alliance will engage actively to enhance international security, through partnership with relevant countries and other international organisations; by contributing actively to arms control, non-proliferation and disarmament; and by keeping the door to membership in the Alliance open to all European democracies that meet NATO’s standards. NATO remains the unique and essential transatlantic forum for consultations on all matters that affect the territorial integrity, political independence and security of its members, as set out in Article 4 of the Washington Treaty. Any security issue of interest to any Ally can be brought to the NATO table, to share information, exchange views and, where appropriate, forge common approaches. In order to carry out the full range of NATO missions as effectively and efficiently as possible, Allies will engage in a continuous process of reform, modernisation and transformation. Today, the Euro-Atlantic area is at peace and the threat of a conventional attack against NATO territory is low. That is an historic success for the policies of robust defence, Euro-Atlantic integration and active partnership that have guided NATO for more than half a century. However, the conventional threat cannot be ignored. Many regions and countries around the world are witnessing the acquisition of substantial, modern military capabilities with consequences for international stability and Euro-Atlantic security that are difficult to predict. This includes the proliferation of ballistic missiles, which poses a real and growing threat to the Euro-Atlantic area. The proliferation of nuclear weapons and other weapons of mass destruction, and their means of delivery, threatens incalculable consequences for global stability and prosperity. During the next decade, proliferation will be most acute in some of the world’s most volatile regions. Terrorism poses a direct threat to the security of the citizens of NATO countries, and to international stability and prosperity more broadly. Extremist groups continue to spread to, and in, areas of strategic importance to the Alliance, and modern technology increases the threat and potential impact of terrorist attacks, in particular if terrorists were to acquire nuclear, chemical, biological or radiological capabilities. Instability or conflict beyond NATO borders can directly threaten Alliance security, including by fostering extremism, terrorism, and trans-national illegal activities such as trafficking in arms, narcotics and people. Cyber attacks are becoming more frequent, more organised and more costly in the damage that they inflict on government administrations, businesses, economies and potentially also transportation and supply networks and other critical infrastructure; they can reach a threshold that threatens national and Euro-Atlantic prosperity, security and stability. Foreign militaries and intelligence services, organised criminals, terrorist and/or extremist groups can each be the source of such attacks. All countries are increasingly reliant on the vital communication, transport and transit routes on which international trade, energy security and prosperity depend. They require greater international efforts to ensure their resilience against attack or disruption. Some NATO countries will become more dependent on foreign energy suppliers and in some cases, on foreign energy supply and distribution networks for their energy needs. As a larger share of world consumption is transported across the globe, energy supplies are increasingly exposed to disruption. A number of significant technology-related trends – including the development of laser weapons, electronic warfare and technologies that impede access to space – appear poised to have major global effects that will impact on NATO military planning and operations. The greatest responsibility of the Alliance is to protect and defend our territory and our populations against attack, as set out in Article 5 of the Washington Treaty. The Alliance does not consider any country to be its adversary. However, no one should doubt NATO’s resolve if the security of any of its members were to be threatened. Deterrence, based on an appropriate mix of nuclear and conventional capabilities, remains a core element of our overall strategy. The circumstances in which any use of nuclear weapons might have to be contemplated are extremely remote. As long as nuclear weapons exist, NATO will remain a nuclear alliance. The supreme guarantee of the security of the Allies is provided by the strategic nuclear forces of the Alliance, particularly those of the United States; the independent strategic nuclear forces of the United Kingdom and France, which have a deterrent role of their own, contribute to the overall deterrence and security of the Allies. continue to review NATO’s overall posture in deterring and defending against the full range of threats to the Alliance, taking into account changes to the evolving international security environment. Crises and conflicts beyond NATO’s borders can pose a direct threat to the security of Alliance territory and populations. NATO will therefore engage, where possible and when necessary, to prevent crises, manage crises, stabilize post-conflict situations and support reconstruction. The lessons learned from NATO operations, in particular in Afghanistan and the Western Balkans, make it clear that a comprehensive political, civilian and military approach is necessary for effective crisis management. The Alliance will engage actively with other international actors before, during and after crises to encourage collaborative analysis, planning and conduct of activities on the ground, in order to maximise coherence and effectiveness of the overall international effort. The best way to manage conflicts is to prevent them from happening. NATO will continually monitor and analyse the international environment to anticipate crises and, where appropriate, take active steps to prevent them from becoming larger conflicts. Where conflict prevention proves unsuccessful, NATO will be prepared and capable to manage ongoing hostilities. NATO has unique conflict management capacities, including the unparalleled capability to deploy and sustain robust military forces in the field. NATO-led operations have demonstrated the indispensable contribution the Alliance can make to international conflict management efforts. Even when conflict comes to an end, the international community must often provide continued support, to create the conditions for lasting stability. NATO will be prepared and capable to contribute to stabilisation and reconstruction, in close cooperation and consultation wherever possible with other relevant international actors. broaden and intensify the political consultations among Allies, and with partners, both on a regular basis and in dealing with all stages of a crisis – before, during and after. We are resolved to seek a safer world for all and to create the conditions for a world without nuclear weapons in accordance with the goals of the Nuclear Non-Proliferation Treaty, in a way that promotes international stability, and is based on the principle of undiminished security for all. With the changes in the security environment since the end of the Cold War, we have dramatically reduced the number of nuclear weapons stationed in Europe and our reliance on nuclear weapons in NATO strategy. We will seek to create the conditions for further reductions in the future. In any future reductions, our aim should be to seek Russian agreement to increase transparency on its nuclear weapons in Europe and relocate these weapons away from the territory of NATO members. Any further steps must take into account the disparity with the greater Russian stockpiles of short-range nuclear weapons. We are committed to conventional arms control, which provides predictability, transparency and a means to keep armaments at the lowest possible level for stability. We will work to strengthen the conventional arms control regime in Europe on the basis of reciprocity, transparency and host-nation consent. We will explore ways for our political means and military capabilities to contribute to international efforts to fight proliferation. National decisions regarding arms control and disarmament may have an impact on the security of all Alliance members. We are committed to maintain, and develop as necessary, appropriate consultations among Allies on these issues. NATO’s enlargement has contributed substantially to the security of Allies; the prospect of further enlargement and the spirit of cooperative security have advanced stability in Europe more broadly. Our goal of a Europe whole and free, and sharing common values, would be best served by the eventual integration of all European countries that so desire into Euro-Atlantic structures. The door to NATO membership remains fully open to all European democracies which share the values of our Alliance, which are willing and able to assume the responsibilities and obligations of membership, and whose inclusion can contribute to common security and stability. The promotion of Euro-Atlantic security is best assured through a wide network of partner relationships with countries and organisations around the globe. These partnerships make a concrete and valued contribution to the success of NATO’s fundamental tasks. Dialogue and cooperation with partners can make a concrete contribution to enhancing international security, to defending the values on which our Alliance is based, to NATO’s operations, and to preparing interested nations for membership of NATO. These relationships will be based on reciprocity, mutual benefit and mutual respect. We are prepared to develop political dialogue and practical cooperation with any nations and relevant organisations across the globe that share our interest in peaceful international relations. We will be open to consultation with any partner country on security issues of common concern. We will give our operational partners a structural role in shaping strategy and decisions on NATO-led missions to which they contribute. We will further develop our existing partnerships while preserving their specificity. enhanced practical cooperation in managing crises where both organisations are engaged. cooperate more fully in capability development, to minimise duplication and maximise cost-effectiveness. NATO-Russia cooperation is of strategic importance as it contributes to creating a common space of peace, stability and security. NATO poses no threat to Russia. On the contrary: we want to see a true strategic partnership between NATO and Russia, and we will act accordingly, with the expectation of reciprocity from Russia. use the full potential of the NATO-Russia Council for dialogue and joint action with Russia. develop a deeper security partnership with our Gulf partners and remain ready to welcome new partners in the Istanbul Cooperation Initiative. Unique in history, NATO is a security Alliance that fields military forces able to operate together in any environment; that can control operations anywhere through its integrated military command structure; and that has at its disposal core capabilities that few Allies could afford individually. engage in a process of continual reform, to streamline structures, improve working methods and maximise efficiency. We, the political leaders of NATO, are determined to continue renewal of our Alliance so that it is fit for purpose in addressing the 21st Century security challenges. We are firmly committed to preserve its effectiveness as the globe’s most successful political-military Alliance. Our Alliance thrives as a source of hope because it is based on common values of individual liberty, democracy, human rights and the rule of law, and because our common essential and enduring purpose is to safeguard the freedom and security of its members. These values and objectives are universal and perpetual, and we are determined to defend them through unity, solidarity, strength and resolve. It reconfirms the bond between our nations to defend one another against attack, including against new threats to the safety of our citizens. It commits the Alliance to prevent crises, manage conflicts and stabilize post-conflict situations, including by working more closely with our international partners, most importantly the United Nations and the European Union. It offers our partners around the globe more political engagement with the Alliance, and a substantial role in shaping the NATO-led operations to which they contribute. It commits NATO to the goal of creating the conditions for a world without nuclear weapons – but reconfirms that, as long as there are nuclear weapons in the world, NATO will remain a nuclear Alliance. It restates our firm commitment to keep the door to NATO open to all European democracies that meet the standards of membership, because enlargement contributes to our goal of a Europe whole, free and at peace. It commits NATO to continuous reform towards a more effective, efficient and flexible Alliance, so that our taxpayers get the most security for the money they invest in defence. The citizens of our countries rely on NATO to defend Allied nations, to deploy robust military forces where and when required for our security, and to help promote common security with our partners around the globe. While the world is changing, NATO’s essential mission will remain the same: to ensure that the Alliance remains an unparalleled community of freedom, peace, security and shared values.